The Hole in the Wall is known for its eagles. There must have been hundreds of eagles flying overhead. They would circle above the boat on thermal updrafts. Our first day at the Hole in the Wall, we jumped in the dinghy and followed one of the tourist boats to a feeding station. The power boats would gun their engines and throw chicken skins into the water. With pavlovian precision, dozens of eagles and hawks would swoop down to the water. It was an amazing photographic experience to see these amazing birds with wingspans of at least 4-5 feet gliding over the water. Sometimes they would come in so fast that you could hear the whoosh of their wings. Absolutely beautiful! During our stay at Hole in the Wall, we must have gone to see the eagles at least 3 or 4 times. David was able to get some great film footage after we took out some chicken skins that we bought. The following day, we left the well fed eagles to do a little river exploring. On some sections of the river, locals had built stilt homes. There were fish farms and restaurants and touring boats. They were definitely taking advantage of any tourists they could find. One little restaurant was aptly named "Hole in the Wall". We had heard about some caves along the river that had been carved into the cliffs. We paddled down the winding rivers and nearly got ourselves lost with all the twists and turns. Our first stop was a place called the Croc Cave. It was a low cave that hung right over the water and we were able to paddle right through it dodging stalactites right and left. Fifty years ago, Langkawi did have salt water crocodiles, but they have since been killed off. Thankfully, no crocs here and no need for a flashlight while paddling through. We were able to see the other exit without any difficulty. 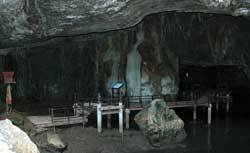 The second cave that we visited was called the Bat Cave. No sign of Albert the butler or the bat mobile here. 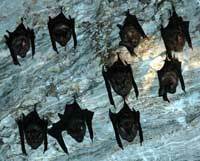 This cave was 10 times as big as the Croc Cave and all over the ceiling small sleeping bats were hanging. We got some great pictures, but also discovered that bats do not enjoy having flashlights shine directly on them while trying to sleep. 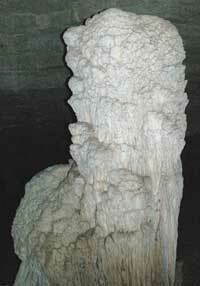 There were huge stalactites and stalagmites all over the place. If you were very quiet you could hear the bats twittering. Ever so slightly creepy! December 15-18, 2004 -- We left Malaysia and Hole in the Wall this morning. Our next stop was right across the border on the island of Tarutao. We had a short, but lovely sail up to Tarutao with light winds. The island itself is a national park and the site of green turtle nests. The island was beautiful which white sand beaches, palm and casuarinas trees. Finding a place to anchor was a little tricky. There was a good breeze blowing and the bottom poor holding. One of our friends on another boat must have thrown down their anchor and then pulled it up again at least 10 times (all by hand) and then tried moving from spot to spot. Pretty frustrating. We like to call our anchor Grabthar. Dave made sure that it was a good 2-3 times heavier than the anchors that most cruisers carry. So anchoring was no problem for us. We went right into the island and found loads of shells on the beach. At the park headquarters, they require an entrance fee. 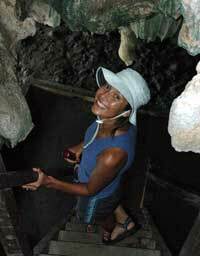 Then you could look at exhibits about the history of the island and dinghy up to yet another cave. We discovered that the island of Tarutao was used to house criminals for about 100 years. Early in the 20th century, Tarutao was a crocodile infested island. They housed everyone from common petty criminals to political prisoners. However, during WWII the prison and its inmates were abandoned by the Thai government. No supplies were coming to the island. So out of desperation, the guards and the inmates joined forces to become pirates and raided a passing ship. When they realized how well off they could be through piracy, they found a new trade. For 10-15 years they terrorized Thai waters until British forces were called in during the 1950¡¯s to take control of the island once more. Now the island houses campers and backpackers. 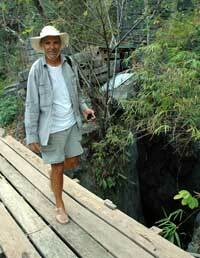 After combing the beaches, Dave, David, and I went to check out the Croc Cave (yes, another Croc Cave). We must have dinghyed about 1-2 miles up the river to find the cave. We found a walkway to the cave, but then Dave noticed that about 50 feet from the start of the walkway the floor had fallen through!! Hmm, well that wasn't an option. So we went a little farther up the river and we found a rickety dock had been made out of bamboo near to the entrance of the cave. We hiked up to the cave and found a small temple at the entrance. Maybe it was for spelunkers lost in the inky darkness! 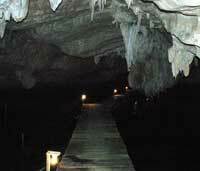 We started into the cave and found that there was a floating dock for a good 100 meters. Unfortunately, we had forgotten our flashlights! Some spelunkers we are!! However, we decided to brave on by using the flash from Dave's camera as our guiding light. The deeper we went into the cave, the darker it got. The dock was bobbing up and down. Dave would shine the light for 2-3 seconds and we would move forward another 10 feet while holding hands. Inch by inch it's a cinch, eh! Occasionally, someone would yell, "duck, stalactite" or "watch out for that step"or "look out for that hole in the dock!" What the heck were we thinking!! We were about to become the newest inhabitants of Tarutao island!! Once we could not see anything at all, we decided that it would be best to turn back. As we came out of the cave, we saw that there was a generator rigged up to some lights in the cave! 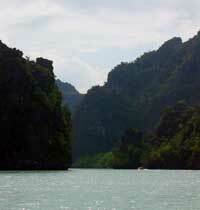 Some other cruisers were also coming down the river in their dinghy to explore the cave. Together with the other cruisers we figured out how to get the generator going and presto, the whole cave was drowned in light to reveal beautiful stalactites and stalagmites made out of sparkling crystals and delicate gypsum formations. As fun as it had been in the dark, there was so much amazing stuff to see in the light. So far, Thailand has been beautiful. Our next stop after Tarutao Island was Ko Petra (pronounced Petra). It was a gorgeous sail. The water here is an amazing shade of blue. The island rises out of the ocean as if God had poked his finger through the surface of the earth and straight up towards the heavens. We heard about Ko Phetra while in Singapore. Apparently, the island is a nesting sanctuary for swallows. The nest of a swallow is worth hundreds, if not thousands of dollars. The nest is prized by the Chinese who use the saliva found in the nest for a soup. It is considered to be a culinary delicacy! The swallows build their nest high on the cliff faces. Using bamboo poles and rope that is strung along the cliff, people climb up to collect bird nests. Now the Thai government is in on the action at the island of Phetra. They have a station manned with an AK-47 for anyone who illegally tries to collect swallow¡¯s nests. Supposedly, if you get too close to the island that guard shoots a couple of rounds of ammo into the air. The guard must have been on holiday when we arrived. There were a few other boats around the island and absolutely no sign of swallows. However, you could see where bamboo had been connected to the cliff to create a primitive climbing system. How they hoist themselves up for hundreds of feet is beyond me! 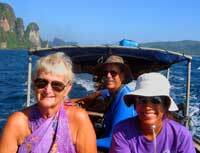 After spending the night at Ko Phetra, we headed for the island of Ko Muk. 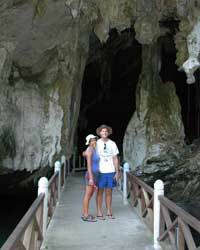 Our friends on Sea Tjalm had told us about an amazing sea cave that allowed passage back to a secluded little beach. Ko Muk was another island with amazing towering cliffs. 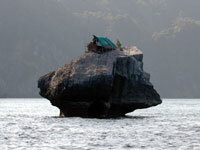 As we neared the island, we saw a little hut that had been built on top of a large and isolated rock. There was a rope over the side of the rock down to the water. Whoever lived there even brought in a little tree for some shade on top of the rock. Once we anchored, we set out for the cave by dinghy. There was a large entrance on the cliff face. We jumped into the water and swam over. As you went in to the cave, the water went a beautiful emerald color with sunlight streaming in from an overhead hole. We followed a tour group into the cave. They were all fitted out with lifejackets and flashlights. The deeper we went into the cave you went, the louder the crash of the waves seemed to be. All of sudden, as we rounded a corner there was the opening into a hidden little beach area with towering walls all around it. It was beautiful. We decided that we had to come back with cameras, so we made a second trip into the cave with our dinghy and cameras in hand. Lanta island was our next stop. Lanta was a bit more touristy with little bungalows on the beach and lots of European vacationers. 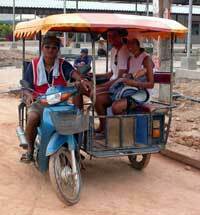 We went in for a bit of a walk and saw that many Thai people are still living very simply. Small huts on stilts with chickens running around and cows on the road. Everyone is trying to make the most of the tourist industry , so people would have small shops and restaurants attached to their homes. In town, there was a kaleidoscope of shops with dive shops, fake Rolexes and Louis Vuitton bags, DVDs, T-shirts, fruits, travel shops, etc. Bargaining is the way to do things here. On just about every item, you could get the price down 50-75%. On the way back, we decided to try out the local transportation which was a moped rigged with a side car seating 4 people. The need for speed was the operative word with our driver. He zipped down the dirt roads and swerved around corners. Thankfully, we arrived intact back at the beach. Then it was back to the boat for another night before heading out to the Phi Phi Islands. 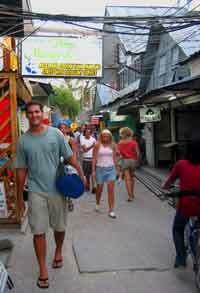 December 19-22, 2004 -- The beautiful and crowded Phi Phi Islands (pronounced Pee Pee) were our next destination. These islands were made famous in the movie The Beach with Leonardo Di Caprio. If not for all the people and the power boats, it would be a lovely cruising destination. We went around the southern island first and to Maya Bay where the movie was filmed. The water was absolutely crystal clear, but peppered with snorkelers and swimmers and divers and boats. We ended up going to the main island, called Phi Phi Don. This is where all the hotels and restaurants are. Dive shops were scattered around the town, so I took the opportunity to sign up for some scuba lessons and got my PADI certification. It was a wonderful place to scuba dive. To get to the reef we took the dive boat out to some nearby islands for 2 excellent days of scuba diving. The coral reef and reef life were amazing -- a wall of color! We saw sharks, lion fish, parrot fish, flounder, clown fish (AKA Nemo) ... and so much more. David came within 3 feet of a leopard shark. My instructor, Andy, was from the UK and did a fantastic job. David even came along on the trip and we met up with some other Brits, Kiwis, South Africans, and French divers. David and I had a great time. After diving for 3 days, I got my certification and a cool DVD of the last dive we did. We might even try to get some of the footage online as stills. Then every night, we would come back to the main island and have fantastic meals on the beach for next to nothing. Not bad for the cruiser lifestyle! Our other adventure on the island was taking a homemade longtail boat with a rigged engine from one island to the other. We had a bouncy ride with sea-spray going everywhere! 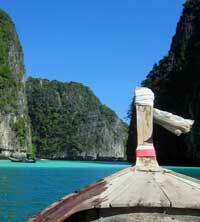 We did an in-depth tour of the southern Phi Phi Island where The Beach was filmed. There was a gorgeous inlet there with aqua water and a white sand bottom. We checked out Maya Beach which was choked full of tourists. The beach was lovely, but the moment you stepped on it, one of the Thai "beach-keepers" would approach you and ask for a park entrance fee of 20 baht (about 50 cents). And on the way back a huge ocean cruiser called the Star Flyer sailed into port with loads of tourists. 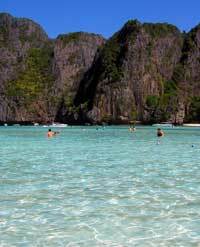 The only downside for being at Phi Phi Island were the sheer numbers of people that would come to visit the island. The only way in to the island was by ferry. These huge boats would come ripping into the bay and leave huge trails of wake behind them. While I was cooking in the kitchen, stuff would be flying off the counter top and shelves as we whipped back and forth. After three days of enduring ferry wake, we headed out from the Phi Phi Islands for Phuket. December 22-24, 2004 -- Phuket is our port of call for Thailand. We checked in here with customs and immigration and then checked out the town. Phuket is known as the Pearl of the Orient and is probably one of the touristy highlights of Thailand. It is a huge island and just about everything caters to the whims of tourists. The cruiser community is huge here. There are so many little islands to visit, that some people stay and sail in Thailand for years. At our first anchorage in Chalong Bay, there must have been about 50 sailboats! The Abbotts have run into quite a few people that they knew from earlier sailing trips. Our main priority in being at Phuket was to celebrate Christmas properly! The cruisers were having large celebration and dinner together at one restaurant. So we got all signed up and had a wonderful meal with about 200 other people! It was a pretty fancy dinner with all the fixings, including a statue of a reindeer that unfortunately toppled over and lost its head halfway through the night. Cruisers come from all walks of life! You can hear bits and pieces of so many different languages -- malay, german, french, english, italian, spanish, russian, polish ... It was great to meet up with some other yachties. We met with friends that we had seen in Malaysia and Bali. Today we are having our own Christmas celebration on the boat with a gift exchange, caroling, reading the Christmas story, and making cookies!! So Merry Christmas and Happy New Year to all of you! December 26, 2004 -- It was a beautiful morning here in Phuket. We decided to leave the little bay where we were anchored for Christmas in order to get back towards civilization. And then, the most peculiar thing happened ... as we were pulling up our anchor, I looked at the beach and saw some very strange surf. I really didn't think much of it at the time. Dave saw weird standing waves as we exited the bay. We went on our way and were out for about 30 minutes when strange messages started to come over the VHF radio. We heard bits and pieces saying "tidal wave" and earthquake". As we looked back towards the bay, about 30 other sailboats were exiting the bay all at the same time. How very strange!! For the next 6 hours we were hooked to our VHF radio listening in on what had happened. About 1 hour later the picture started to become clearer. 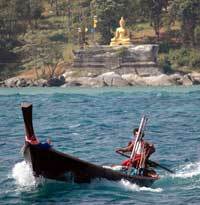 We learned that there had been a large wave to come through Nai Harn Bay where we had been anchored. It rose up about 15-25 feet when it hit the beach at about 10 AM in the morning. Then all the water got sucked out of the bay before the next wave came in. Thankfully, no boats bottomed out. We had just left the bay and were completely unaware of what had happened. When the wave hit the beach, it took out all the beach goers sitting in their sun chairs and with their umbrellas. The wave swept up over the wall into the street sweeping away mopeds, overturning cars, bringing down shops ... Many people were injured at our little beach, but none killed that we know. The cruisers who were anchored in the bay were able to ride out the wave because the water was deep enough. We sailed around the edge of the bay for at least 6 hours. You could see a line of debris in the water that was clearly marked with a brown line. We heard that in large Chalong bay where many sailboats anchored, boats had been thrown on the beach and sunk. People eating at the beachside restaurants had been badly injured. It was a total mess!! How thankful we were to God that we were OK. Down in Langkawi, 2 of the marinas where we stayed were totally decimated. We heard horror stories from the more touristy beaches of Phuket and that many Christmas vacationers were taken out to sea, cruisers near the beach saw plastic models in the water that they mistakened for bodies ... Rumors abounded on the VHF. We heard about second and third waves that could be coming. There was a general sense of panic in the cruising community because no has ever really dealt with tidal waves before. One of our friends on another boat got in touch with his brother in SF and got frequent updates about the situation: a 8.9 underwater earthquake near the NW corner of Sumatra which created a 10 meter gap between the tectonic plates along a 1000 km stretch. The buckling created a huge tidal wave with India and Sri Lanka taking the brunt of it. If the earthquake had been out just another degree we could have gotten badly hit. We finally came back in and anchored in the same little bay about 6 hours later. There was debris in the water -- deck chairs, umbrellas, ice boxes, trees ... The beach had been totally swept away. The little restaurant where we ate the night previously was a total loss. All that was left was the concrete floor. Many of the cruisers helped by collecting chairs and other debris to take into shore. Dave and David went in to get some photos and video of the damage. It really looked like a tornado hit here! It has been a pretty crazy day. I think that we have all been a little on edge. Everyone has been watching the water, checking their depth meter, staying on their boat ... We worry about aftershocks and what else could come. But it so wonderful having that blessed assurance that we are sitting in the center of God's loving hand. December 29, 2004 -- The reports out of southeast Asia just keep getting worse. We are hearing that the death toll is already above 50,000 and may well rise above 100,000. Despite all the devastation and destruction here in Phuket, it would appear that we got off quite lightly compared to Sri Lanka, India, and Sumatra. Here at Nai Harn bay we have been doing what little we can -- helping clean up the beach, donating clothing and toiletries. To our knowledge no one died at this beach. 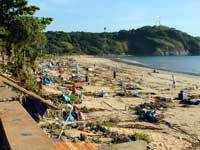 Large tourist sections of the island have been closed for the clean-up. It is a messy place to be. Thank you for all your emails and entries in the guestbook. It has been wonderful to know that we have friends and family praying for us. Home is where the hut is! Ooo, was it a wet but fun ride! Ready for a little underwater football!! I have absolutely no idea what kind of fish this is.